We all know that DevOps brings together people, processes, and technology. 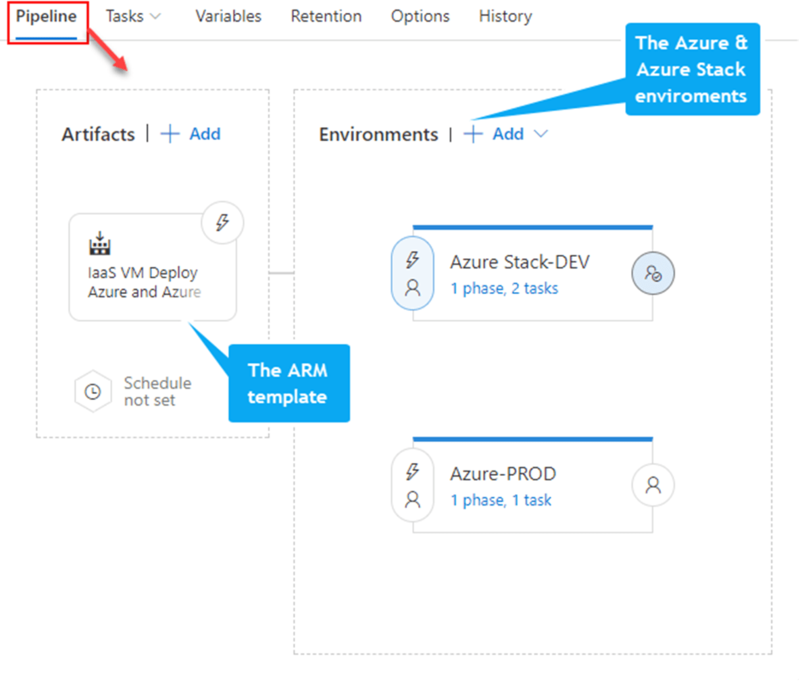 In the Microsoft DevOps world A large part of the technology piece is utilizing Visual Studio Team Services (VSTS) for continuous deployment of workloads to Azure. Microsoft launched their Hybrid Cloud on July 10th 2017. Azure Stack is the secret sauce of Microsoft’s the Hybrid Cloud. Microsoft’s offering is the only one true Hybrid Cloud in the market bringing Azure to on-premises data centers. As Microsoft continues to move their Hybrid Cloud forward the DevOps integration and capabilities we have for Azure extend to Azure Stack. Again I was fortunate to participate in a preview of the VSTS integration with Azure Stack. I was happy to see Microsoft putting a priority on this functionality because DevOps on Azure Stack is a HUGE need. Cloud is often the catalyst to helping organizations adopt a DevOps culture fostering digital transformation. Some organizations not being able to put all workloads in public cloud Azure Stack is a good way for them to get the same cloud capabilities on-premises DevOps integration being one of them. The setup and integration between VSTS and Azure Stack is working nicely. The team at Microsoft has given me permission to share about this topic via my blog. 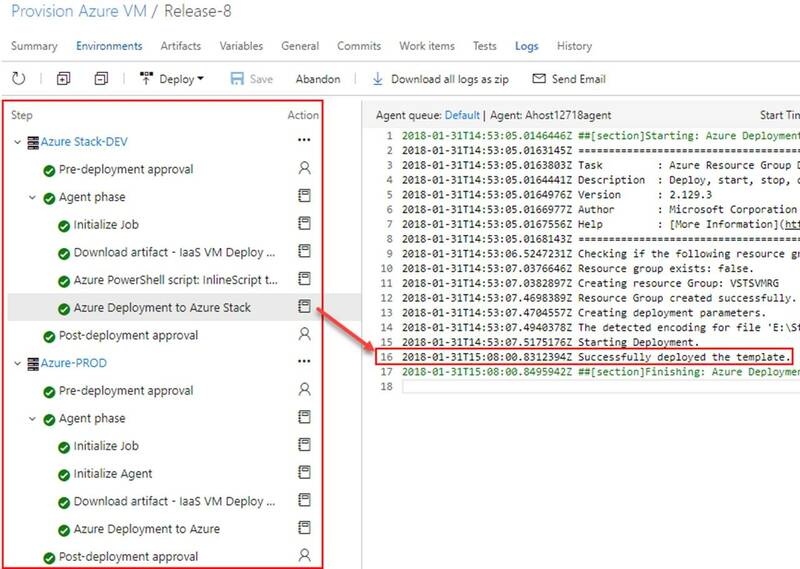 In this blog post I am going to cover setting up VSTS to work with Azure and setting up a continuous-integration and-continuous deployment (CI/CD) pipeline to Azure Stack. With Microsoft DevOps you can utilize the pieces of VSTS that make sense for you to use leaving the control up to you. 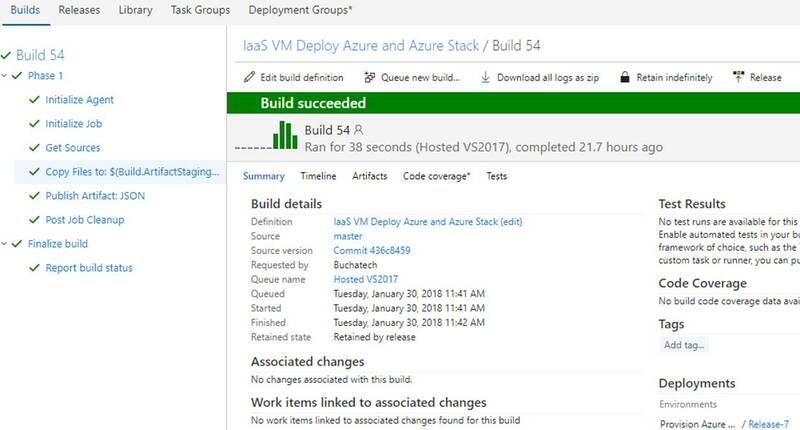 Through VSTS you can use many other DevOps tools such as Jenkins, Octopus deploy, GitHub, Bitbucket etc into your pipeline making Azure Stack just as flexible as Azure is. Let’s Jump in! #1 Ensure you have installed the Azure Stack PowerShell and Azure PowerShell modules. NOTE: You will need the environment name and the tenant ID for the next script. You will use information from the Service Connection output in the next step. Navigate to one of your projects. Next input the needed data. This data comes from the Service Connection info that you copied. You can put whatever you want in the Connection name and the Subscription Name. Note do not verify the connection. 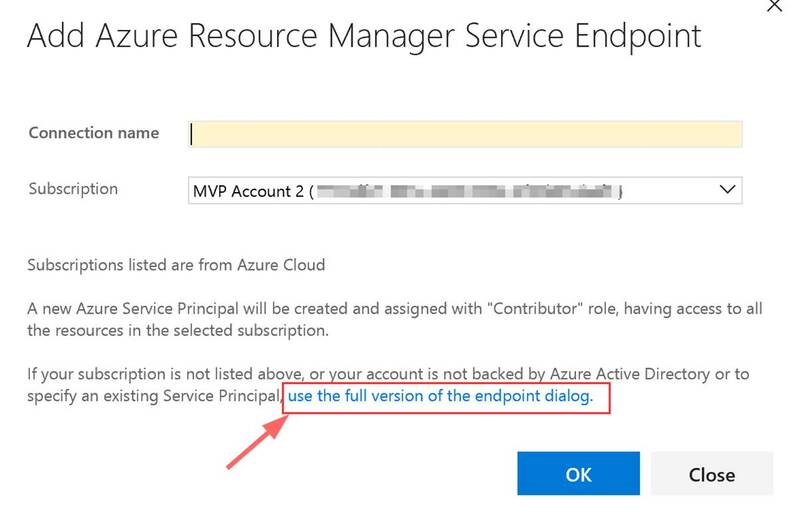 It will not succeed as VSTS cannot access your private Azure Stack yet. Click OK when done. 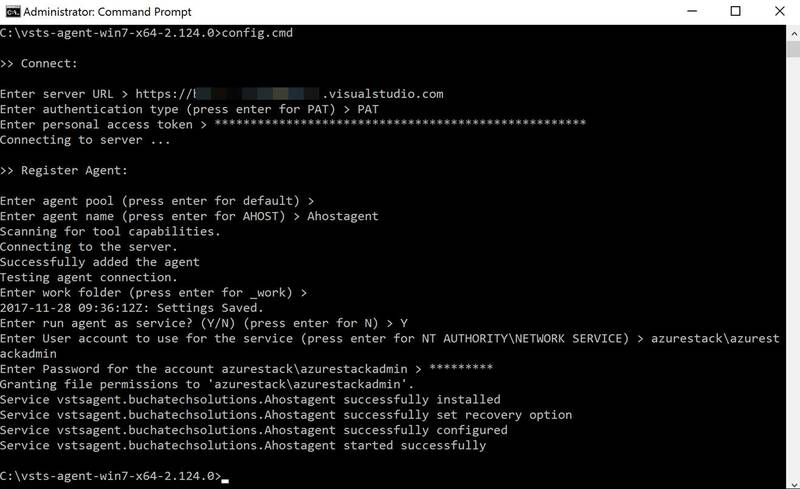 Next you need to setup the build agent on the Azure Stack host. (Note: In this post I am using the ASDK.) 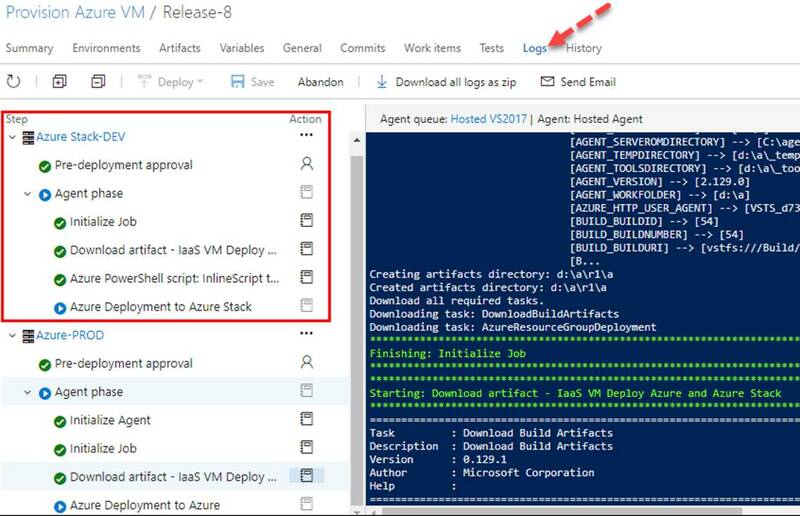 From within VSTS download the Windows agent. Extract the download to a local folder. 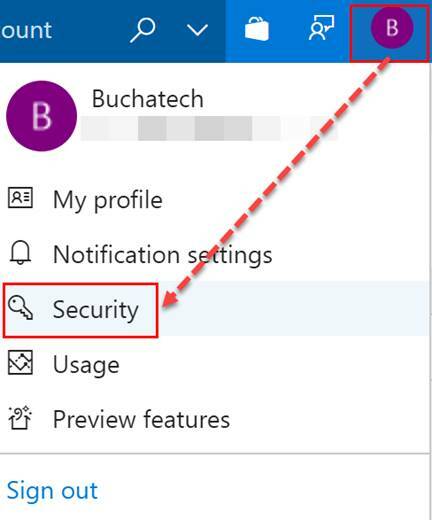 Go to Security under your profile in VSTS. Next add a Personal access token (PAT) for Azure Stack. Copy the token. Note it will not be shown again ever after you leave this screen. In the folder with the extracted build agent you will see the following. We need to run the run.cmd file from an elevated command prompt. Here is a screenshot of running the run.cmd. I recommend deploying the build agent as a service. You will use your personal access token (PAT) here and the azure stack admin account. 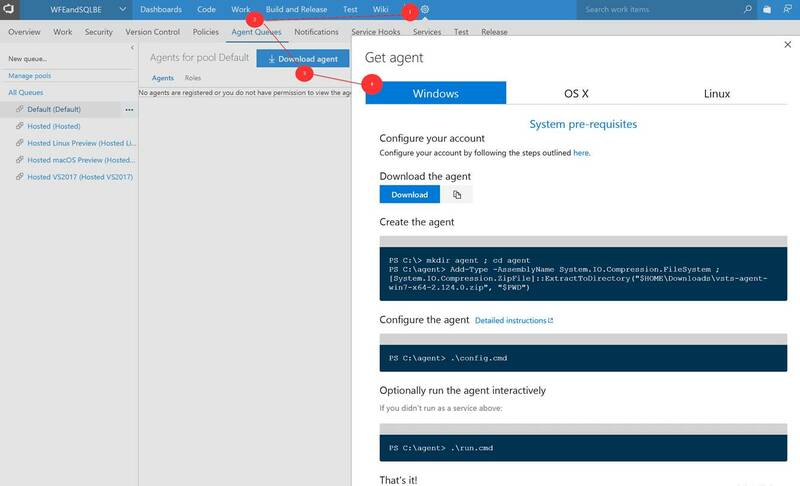 You can now see the agent in VSTS. 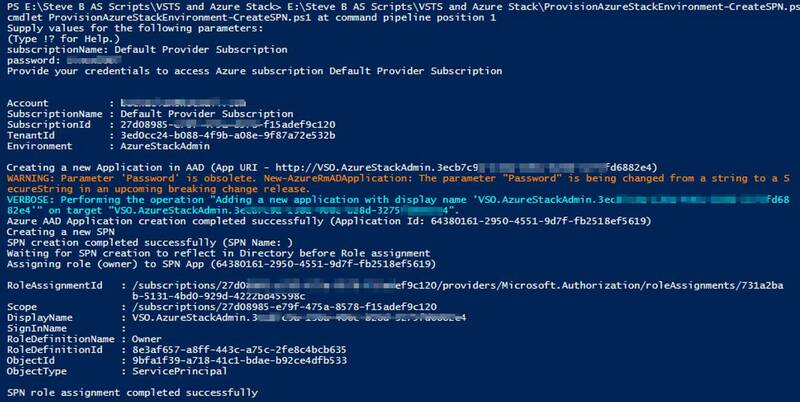 That’s it for the setup for connecting VSTS to Azure Stack. 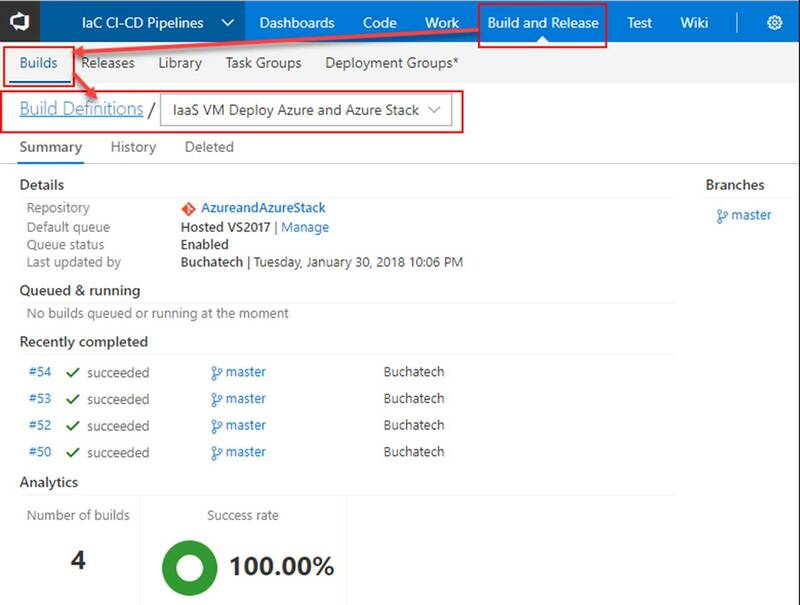 Next let’s look at setting up a continuous-integration and-continuous deployment (CI/CD) pipeline for VM-deployment to Azure Stack. What I cover here is focused on infrastructure as code (IaC) using ARM templates. 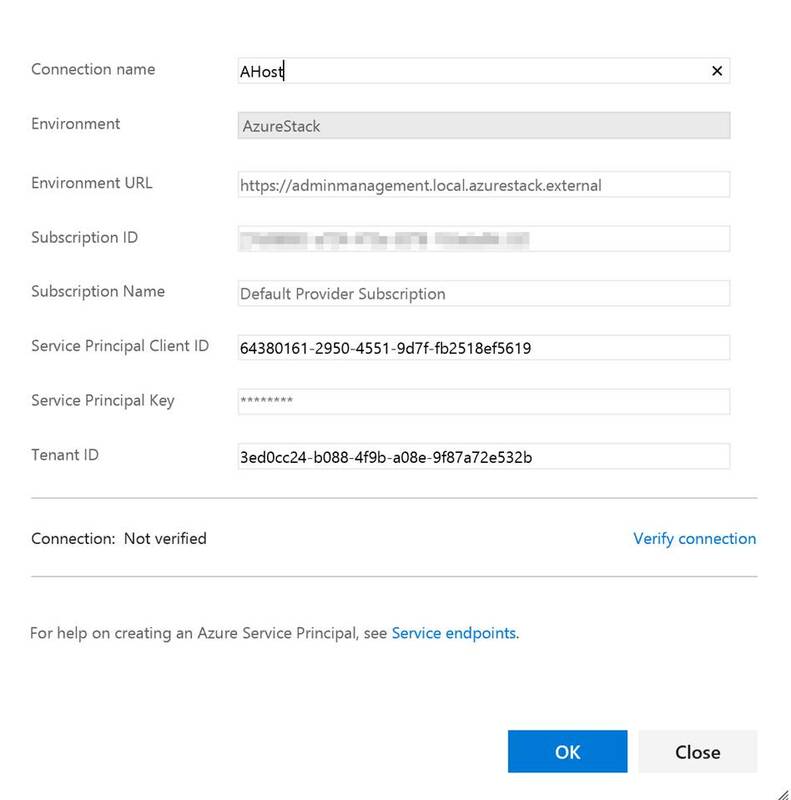 If you need to set up CI/CD to Azure Stack for Web Apps, Mobile Apps, Containers, etc the process is the same as it is on Azure with the only difference being that you point to Azure Stack. Also note that in this post I am using the ASDK not multi-node. Within VSTS create a new repository and place your ARM template in it. Next click on Build and Release. Create a new Build Definition. In the build definition. Point the Get sources to the repository you just created. Add 2 tasks under Phase 1. 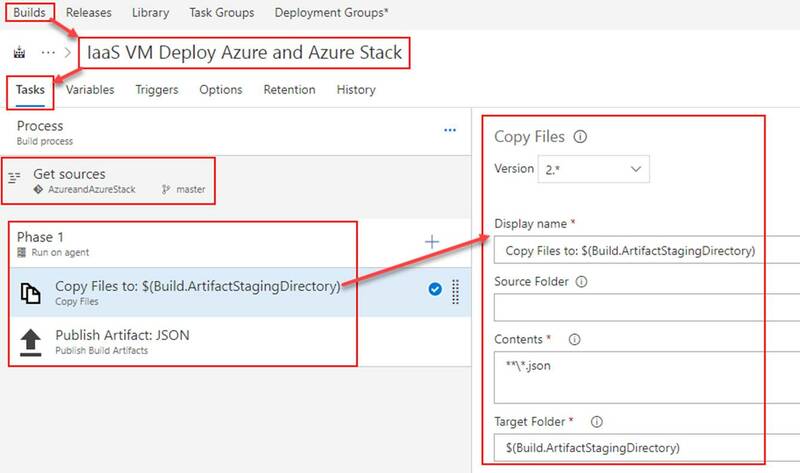 The first task will copy the ARM template to the build staging directory. The second task will publish the ARM template so that a release definition can pick it up. Both tasks are shown in the following screenshots. OPTIONAL: To setup continuous integration click on Triggers. Here you can set a schedule to run the builds or you can click on the repository as shown in the screenshot and then check Enable continuous integration. By checking the box next to Enable continuous integration it tells VSTS that anytime content in the repo is changed to run a build. 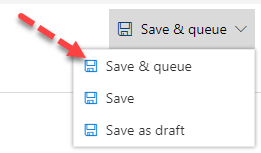 Click on Save & queue. This will start the build. The build will start. As long as everything is setup properly within your build it will succeed as shown in the following Screenshot. That’s all for our build. Next up we need to create a release definition (RD) pipeline. The RD will take the build artifacts and deploy to an environment/s you specify. The first thing you need to do is click on Releases under Build and Release. Then click on the + button and then Create release definition. Next you need to Click on Edit next to your release definition. We want to configure our release definition pipeline so that it will look like the following screenshot. 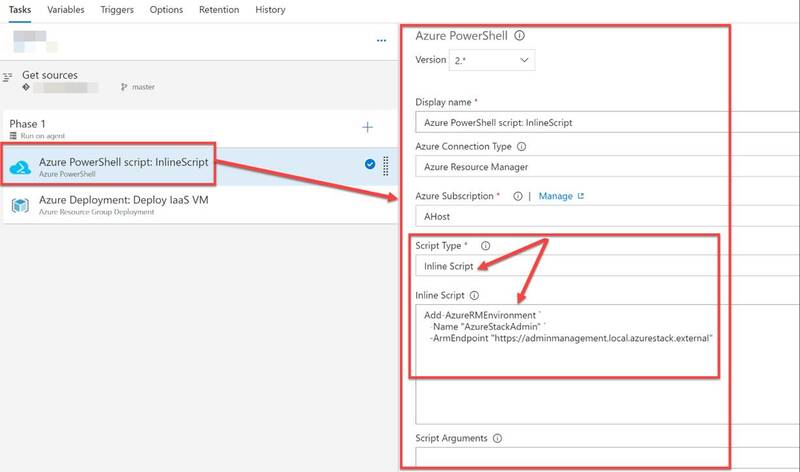 When it’s all said and done you should have your VM’s ARM template as the artifact and an Azure Stack environment for deploying to. In the screenshot example I also have an Azure environment. Next to Artifacts click on + Add. Select Build as your source type. Next you need to add an environment. Click on + Add. An environment will have at least a phase and will need a task/s. 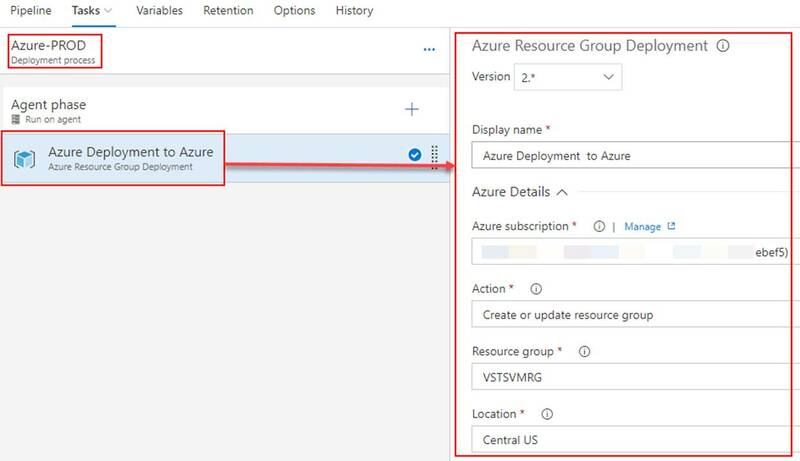 For an Azure environment add the Azure Resource Group Deployment task. Configure settings as desired. Add your ARM template and configure any needed parameters. For the Azure Resource Group Deployment task configure settings as desired. Add your ARM template and configure any needed parameters. To add the variable click on Variables>>Process variables and then add a new variable with the following “Name = VSTS_ARM_REST_IGNORE_SSL_ERRORS Value = true” as shown in the following screenshot. Optional: You can set pre or post deployment approvals on your environments. These pre and post approvals are used to require an approval before a deployment moves on to the next point. Next create a release. The release will contain your deployment. Your deployment will automatically start if it is setup that way. You also can manually kick off deployments as shown in this example in the following screenshot. Once has started you will see it change to In Progress as shown in the following screenshot. In the release you can click on the Logs tab to see the progress step by step. The next two screenshots show what it looks like when a deployment has successfully completed. Now you can log into your Azure Stack portal and see the VM deployed and running. What is a Google Search Appliance? How do Facebook Chatbots Link with Offline Marketing?